This is the recipe we make most often with our ‘mother recipe’ of Slow Cooker Pulled Pork. Everyone loves it, nobody goes hungry AND if you use part skim mozza, it’s about as healthy as pizza can get – it’s no worse calorie and fat wise than a ham and cheese sandwich but watch out, it’s hard not to eat and eat and eat and eat and then wake up at midnight and scarf a cold piece from the fridge. Enjoy! Place all dough ingredients into your bread maker and run the pizza dough setting. If making by hand, just mix well and knead for about 10-15 min until dough is smooth. Let dough rise until doubled in size. Remove dough from breadmaker and deflate. Cut into two pieces and form into balls. Let rest/rise on your counter under a wet towel (or in an oiled bowl) for at least a 1/2 hour. Once dough has rested shape it into an oblong shape that fits onto a cookie sheet. I always flour my cookie sheet first so it doesn’t stick. I find a cookie sheet works much better than a tinfoil pizza pan. Set dough aside while you get your toppings ready and preheat your oven to 425. 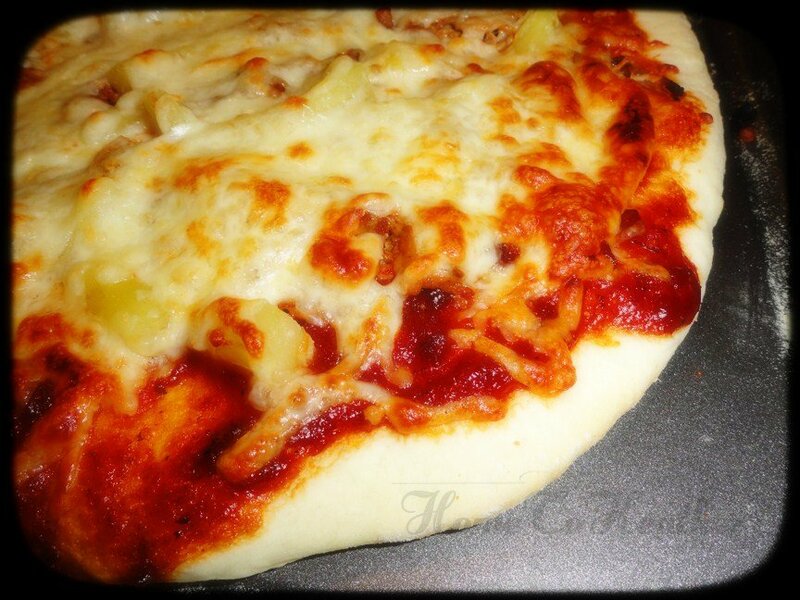 Top your pizza dough with a 50/50 mix of pizza sauce and bbq sauce or mix to your liking. Spread pork, the onion, then pineapple over pizza. Brush crust with a touch of olive oil (optional) Top with shredded cheese and bake for 15 min until edge of crust and cheese start to brown. Let cool for 3 min before slicing. Want more ideas for things to do with leftover pulled pork? I got ya covered! OMG that looks amazing. I love BBQ pizzas, but have always done chicken, so this would be a great change. I’ve never had a BBQ pizza, but this seriously made my mouth water. I’ll be adding this to my menu soon & I’ll link back to you! This looks so delicious!! WHY does all the good stuff have to be carbs? That looks so good! I’m starving! I agree with Rhea too, why does it have to be carbs? I’m trying to cut back on gluten. What a great idea for the leftovers! Writing a note to make this right now!! I love your spin on this! I love it when people get creative with pizza! pizza is the ultimate canvas – you can really make it into anything you want!